alaTest ha raccolto ed analizzato 11 recensioni su Plumen 11W BC Low Energy Decorative Bulb, Opal. La media della valutazione per questo prodotto è 3.5/5, confrontata con la media della valutazione di 4.7/5 per altri prodotti. Abbiamo analizzato differenti valutazioni di esperti ed utenti, età del prodotto ed altri elementi. A confronto con altri prodotti, Plumen 11W BC Low Energy Decorative Bulb, Opal ha ottenuto un alaScore™ complessivo di 81/100 = qualità Molto buono. Bought this for a very high ceiling where we cannot easily replace or clean the fitting. Hopefully this bulb will last as long as it says it will but the fitting itself is lovely, very decorative and looks great. Thank you. As other reviewers have noted, one half failed, then the other and certainly wasn't as long lasting as claimed. 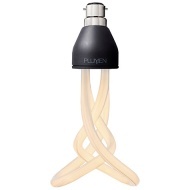 Very disappointing as a lovely looking design but expensive for a light bulb that isn't going to last. Form over function unfortunately. Very disappointed and reviews elsewhere share this opinion. A bit bigger than expected but still looks cool and saves energy! I love the design and it just looks great. I used click and collect which was so easy and will use that service again. 5/5. I started with1 in the hall, its now 2 in the hall and 1 on the landing, all on red Nud cable with no shade and I can't walk past without staring at them!! I love how they look different from every angle, would highly recommend . Stylish and practical good value too. All round winner. Stylish, elegant and most surprising of all, immediately bright. In other words one does not have to wait for it to warm up to shed full strength of brightness. Too good looking to hide under a shade.